Regularly testing and troubleshooting your garage door spring is more important than people think. The spring is a small yet critical part in the garage: they do 90% of the lifting when an automatic opener is used. However, they can lose tension over time, which puts pressure on the motor to work harder than it needs to. Once the motor gets overused, the plastic gears inside can break – your garage won’t be able to open automatically anymore. This is a sudden and costly repair. 2. Pull down on the red, emergency release cord. This disconnects your door from its motor. 3. 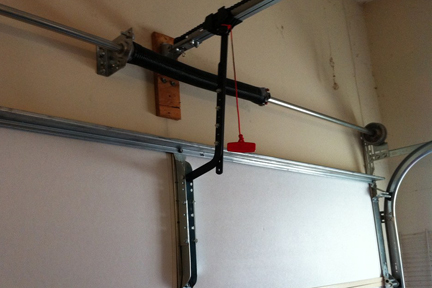 Raise your garage door about halfway up, to the middle position. If it feels heavy, however, do not release your grip – it may come crashing down. Otherwise, release the door. It should stay in this middle position, without moving up or down. This means it is balanced – that your spring and automatic opener are both working properly. 4. Repeat this by lifting the garage door to shoulder height. When you let go, it should rest just like it did in the step before. If the door moves once you release your grip, the general consensus is that the spring is weak and should be replaced. However, this isn’t always true: a small adjustment to the motor’s force could fix this. Decreasing the force slightly could improve the spring’s tension. You can do this at home, but you’ll need to know exactly how much to alter the force (this is in your user’s manual). Afterwards you’ll need to test the safety reversal system. If your spring is weak, we recommend contacting a garage door technician. You can avoid a very costly repair by having a specialist come by. Many times, the specialist can tighten the spring to increase tension, which avoids a full repair. You can call our office at (503) 730-0444 or send us an online request. We are Washington based garage door specialists, and service Vancouver, Portland and surrounding areas. While springs are inexpensive, fees can run from $200 to $400. Note: While some household repairs can wait, garage door repairs should be made immediately. Because of the weight of garage doors, any issues with springs or motor leave you and member of your household vulnerable to injury and break ins. Never take your garage door for granted. Keeping the largest door in your home in good working condition is an essential step in providing a secure home for you and your loved ones.